Enterprise Industry Spotlight— MobileCON 2012's format and focus will attract wireless and telecom leaders and professionals with the opportunity to significantly advance business opportunities and the potential to change the global wireless ecosystem. Attendee Driven Experience— Attendees have the flexibility to choose the learning format that best fits their needs—whether that's immersive through the deep dives or interactive and peer-to-peer through the three thought leadership stages on the exhibit floor. Attendees can set their agenda to drop into any session and format that interests them. This flexibility will better facilitate networking, learning and information gathering. This year's show will feature M2M, security, mobile commerce, enterprise applications, cloud computing and vertical markets. New High-Impact, Short-Form Speaker Sessions— MobileCON 2012 introduces Bit Talks featuring a compelling, diverse lineup of IT leaders from influential companies addressing discrete topics in 15-minute segments. Each Bit Talk will identify one primary problem to be anticipated, avoided or solved and include three things that were learned through the deployment or implementation experience. Diverse, Compelling Keynote Speakers— CTIA has sought a roster of world-class speakers from the private and public sectors. Representing the organizations currently driving mobile enterprise innovation, MobileCON's speaker lineup will start the conversations that will drive the industry's agenda moving forward. One speaker on tap for the occassion is Robin Bienfait, CIO of Research In Motion with others from around the enteprise technological world set to deliver talks as well. Enterprise is big business so it makes a lot of sense that CTIA would dedicate more time to it, if you're looking to attend and need the full details, the press release can be found below. 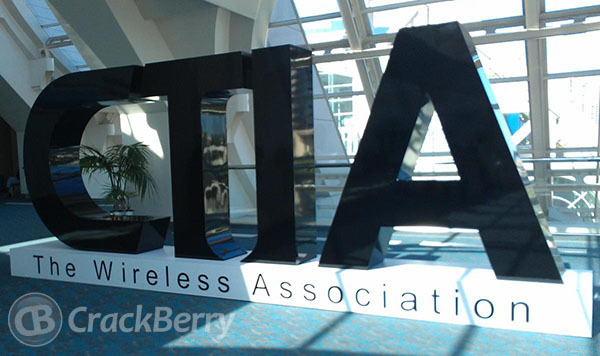 WASHINGTON, D.C., August 14, 2012 – CTIA-The Wireless Association® today announced MobileCON™ 2012, which focuses exclusively on mobile enterprise issues currently challenging a variety of industries. Debuting October 9-11, 2012 at the San Diego Convention Center, the MobileCON event is the next evolution of CTIA's previous Enterprise & Applications™ conference. "Over the past few years, CTIA has been working toward giving our membership and industry the highly specialized events they want and need. MobileCON focuses exclusively on the mobile enterprise IT community, and brings together the industry leaders they want to hear from and exhibitors they need to meet," said Robert Mesirow, CTIA vice president and show director. "The show is specifically designed for wireless and IT professionals who are serious about enterprise mobility, networks and applications, regardless of their industry." Enterprise Industry Spotlight—MobileCON 2012's format and focus will attract wireless and telecom leaders and professionals with the opportunity to significantly advance business opportunities and the potential to change the global wireless ecosystem. Attendee Driven Experience—Attendees have the flexibility to choose the learning format that best fits their needs—whether that's immersive through the deep dives or interactive and peer-to-peer through the three thought leadership stages on the exhibit floor. Attendees can set their agenda to drop into any session and format that interests them. This flexibility will better facilitate networking, learning and information gathering. This year's show will feature M2M, security, mobile commerce, enterprise applications, cloud computing and vertical markets. New High-Impact, Short-Form Speaker Sessions—MobileCON 2012 introduces Bit Talks featuring a compelling, diverse lineup of IT leaders from influential companies addressing discrete topics in 15-minute segments. Each Bit Talk will identify one primary problem to be anticipated, avoided or solved and include three things that were learned through the deployment or implementation experience. Early bird registration and rates are available for MobileCON 2012 through September 10, 2012. Media may pre-register online through October 4. Tickets and up-to-date event information can be found on MobileCON's website: http://www.mobilecon2012.com. For more information on MobileCON 2012, visit http://www.mobilecon2012.com.